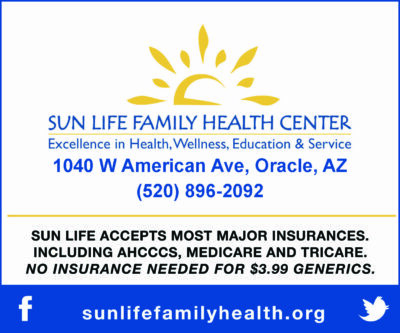 The town of Oracle is a Gateway Community for both the Arizona National Scenic Trail and Oracle State Park. Located at at 4500 feet, temperatures in the grasslands, oaks and junipers are cooler than most of the Copper Corridor. Bench with a View of the San Pedro Valley. 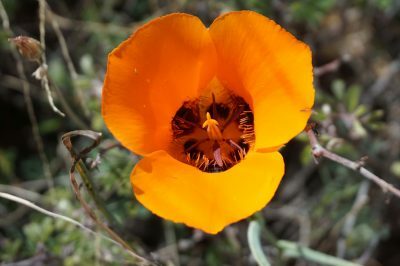 Oracle State Park is now open seven days a week! New Park Manager Vince Micalleff is excited about having the park more accessible to the public and hopes to expand services to offer primitive camping on site in the future. In 2014, it was designated an International Dark Sky Park. To find out the schedule for guided hikes, bike rides, dark sky events and other interpretive programs, visit https://azstateparks.com/oracle. Their annual Open House event is from 1-9 pm on April 29th. To reach the trailhead from Oracle, turn south at the eastern intersection of AZ 77 and East American Avenue, drive 1.5 miles on American Avenue, and then turn right onto Mount Lemmon Road. Continue 1.1 miles to Wildlife Drive and take that 1.0 miles to the Kannally Ranch House. Park entrance fees: $7/vehicle (1-4 adults); individual/bicycle: $3. There are over 15 miles of trails in the park accessible to hikers, bikers and equestrians that can be used to make loops of varying difficulty. The Nature Loop Trail is an easy 1.2 mile hike. Park at the Kannally Ranch House and take the Nature Trail which is signed at the far end of the parking lot. 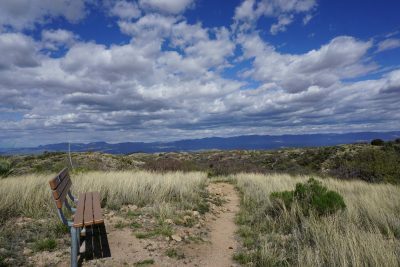 The trail has benches for sitting and enjoying the views of the Catalina Mountains and the San Pedro River Valley. 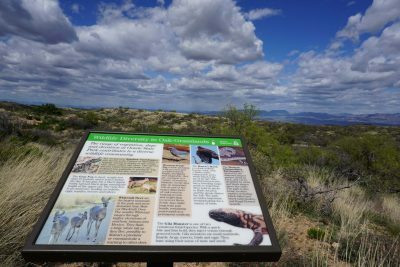 Interpretive signs describe the plants, animals, ecology and geology of the park and surrounding areas. 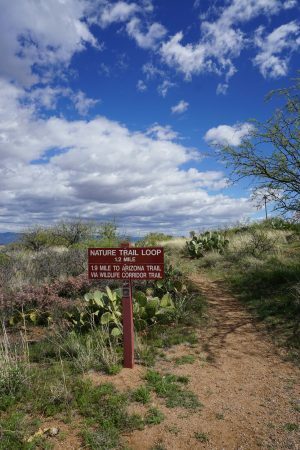 If you’d like to go for more mileage while on the Nature Loop, take the Wildlife Corridor Trail to the Kannally Windmill on the Arizona Trail (3.8 miles round trip). Other longer loops can include the Windy Ridge Trail Loop or the Granite Overlook Loop. See the park brochure or inquire at the ranch for more information. The medium and difficult hike use portions of the 800-mile Arizona National Scenic Trail from American Flag Trailhead. From Oracle, turn south at the eastern intersection of AZ 77 and East American Avenue, drive 1.5 miles on American Avenue, and then turn right onto Mount Lemmon Road. Continue 4.0 miles to American Flag Ranch Road, and turn right (west) to reach the trailheads on both sides of the road, including parking areas near the historic ranch. Established in 1880, the American Flag Ranch is believed to be the oldest existing Territorial post office in the state that is still standing. This hike requires a car shuttle. Place one car at the Arizona Trail crossing at Highway 77 and Tiger Mine Road. From the east entrance to the town of Oracle, drive 0.8 miles east on AZ 77 to mile marker 105 and turn left (north) onto Old Tiger Road. There is a small area for parking cars. Follow the directions above to drive the other car to the American Flag Trailhead to begin the hike. Marney at the Chalet Village Motel is a Trail Angel for AZT hikers and can be contacted in advance about shuttle services at (520) 904- 2122. 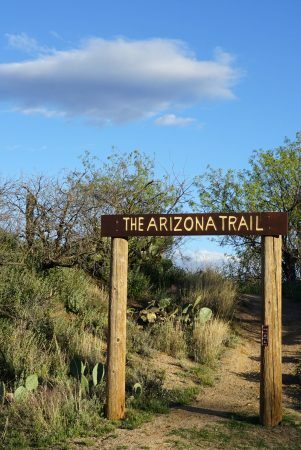 Begin hiking on the AZT by going through the sign that says The Arizona Trail, not the one that says Catalina Mountains. The trail goes past interesting boulder formations and crosses the Mount Lemmon Highway and Webb Road. Enjoy views of the San Pedro River Valley to the east and the Catalinas to the north. Reach the boundary of Oracle State Park at mile 2 and sign the register. Many of the people who hike the Arizona Trail adopt colorful “trail names” and in the spring or fall you might run into someone who is thru-hiking, or doing the whole trail at once. 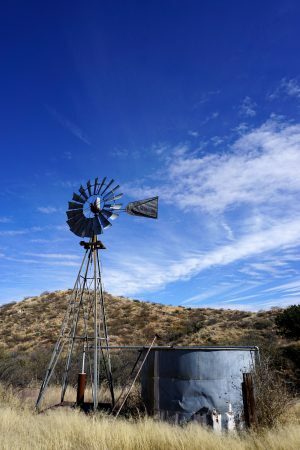 The Arizona Trail through Oracle State Park is beautiful singletrack that passes several trail junctions before reaching the Kannally Windmill at mile 4.3. The windmill does not have any water but there is a bench for a rest or lunch stop. After the windmill, new trail has recently been built that takes you up to a saddle before descending to a trail junction and powerlines at mile 6.0. Cross underneath Highway 77 in a culvert and arrive at your vehicle parked on the north side of the road at mile 7.0. 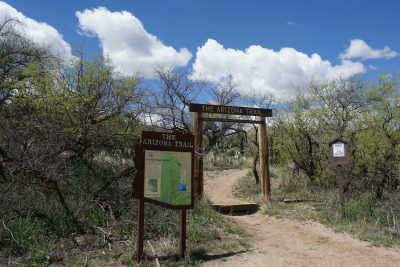 Begin at the American Flag Trailhead and hike on the AZT through the sign that says Arizona Trail – Santa Catalina Mountains Segment. The trail climbs up a hill and then descends into a wooded area with oaks and manzanita. After a short time in the wash, it crosses a road and switchbacks up the hill, passing boulder formations. 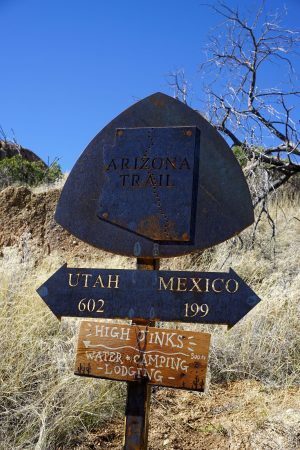 At 2.1 miles, an Arizona Trail sign that says 602 miles from Utah and 198 miles from Mexico marks the turnoff the High Jinks Ranch, a worthy side trip. Take the side trail 500 feet to see this historic ranch, once the gold claim of Buffalo Bill Cody. All are welcome to fill their water at the hose in the courtyard and take a look at the National Register of Historic Places plaque. 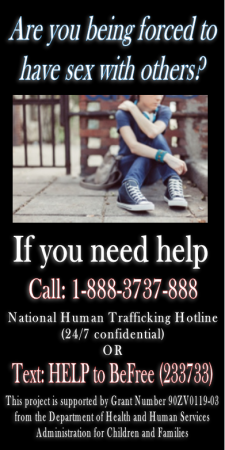 If you’re lucky, one of the caretakers may be around to give a tour and tell more about the accommodations available onsite. 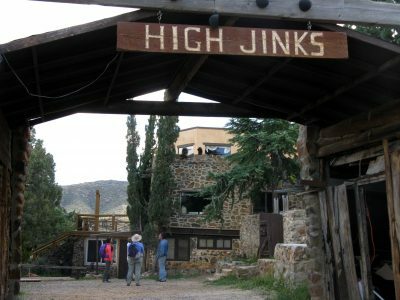 To learn more about the High Jinks Ranch visit www.highjinksranch.net. 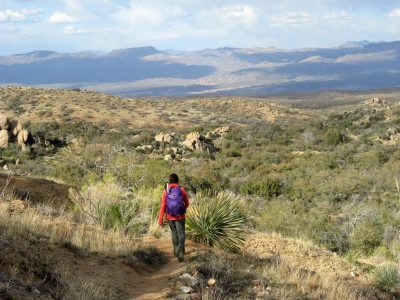 After a visit to the ranch, the AZT contours along the boulder-filled hillside and then resumes climbing toward Oracle Ridge. Reach the junction with Oracle Ridge Trail #1 at 3.2 miles and enjoy expansive views of the San Pedro Valley. This is a good point to turn around for most hikers. However, if you’re in the mood for climbing, the Oracle Ridge Trail will take you a total of 13.2 miles all the way up the mountain to the Control Road at 7765 feet. 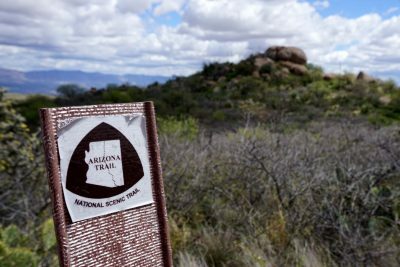 To learn more about the Arizona National Scenic Trail and its Gateway Communities, visit www.aztrail.org.